Saintpaulia plant, known as African violet is part of Gesneriaceae family, brought from Africa and acclimatized all the world. If you know how to take good care, you will enjoy her amazing flower. African Violets like a lot of Bright Light, but not direct sunlight. They do well under fluorescent lighting, but in order to grow well, they must be approximately 4-8 inches from at least 2 fluorescent light bulbs spaced 4-12 inches apart. 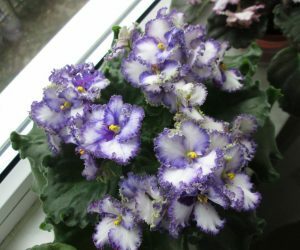 Many people read that African Violet can be grown under fluorescent lights and incorrectly assume that office fluorescent lighting is sufficient. This is not usually the case; the leaves may grow, but the plant will rarely bloom in ambient room lighting. African Violets DO NOT like to dry out; contrary to anything you have read before. They do not like to be waterlogged, because the roots will rot, but they do like to remain moist. Wick watering, or regular top watering is a necessity for strong healthy blooming plants. Never block the holes in the bottom of your pot! African violet roots, like many other Gesneriads, need to breathe. The roots are designed to absorb oxygen and they don’t do that very well underwater. African Violets DO NOT like to be over fertilized. They should get a balanced fertilizer, 20/20/20, 15/30/15, or almost any other specialty fertilizer you may have. Many of the commercial products labeled as African Violet Food are OK for supplementing your growing nutrients, but most are not sufficient when growing for maximum leaf and flower growth. A 7-14-7 type of fertilizer should be supplemented with 20-20-20, 15-30-15, or similar composition fertilizer (the numbers will usually add up to about 60). Fertilizer should be applied 1/4 teaspoon per gallon at every watering, or at least every third watering for best results. African Violets will respond more positively to too little fertilizer, than they will to TOO much. Over fertilizing an African Violet will lead ultimately to cabbage like plants that don’t bloom. Under fertilizing can be recognized by the fact that the lower row(s) of leaves will be lighter green than those in the center. In addition, the outer leaves on an under-fertilized plant are often olive in color or yellow-green in appearance. African Violets do like air circulation, but not to the extent that the plants dry out. I use an oscillating fan in my greenhouses, and a ceiling fan indoors in the plant rooms. You must temper your air circulation with your relative humidity. Higher humidity levels will allow you to increase your air circulation on and around your plants. Be careful with moving air around you plants. Moving air will increase transpiration (evaporation of water through the leaves), it can spread diseases, insects, mildew, and can dry out your plants quickly. As with all of the essential factors in growing violets, too much is TOO MUCH, when in doubt – too little is usually better. Err on the side of austerity. If your plants are too wet, increasing the air circulation may help this problem. If your plants are too dry, you may need to decrease the air circulation around your plants, but I would suggest either more frequent watering, if top watering. If you are wick watering and notice that your plants are too dry, try adding more peat or vermiculite to your soil, or add a wetting agent such as physan 20 or Basic H to your water to increase wicking. Only change one of your growing habits at a time, so that you know which one actually works for YOU. Frequent misting is always a good idea for your violets. You may want to try foliar feeding if you mist regularly. African Violets can be grown in just about any type of soil available, as long as it isn’t too acidic. While they may not grow as well in some soil mixes, I have heard of people growing them in yard dirt! (I wouldn’t, but some people do!…) I think that the soil-less mixes are fairly well received by most plants. I use a combination of perlite, vermiculite, charcoal, and peat. There are many additives that some people put into their soil mixes, but I have found that the less you put into the mix, in general, the easier it is to control the nutrients by adding or removing them from your fertilizers. It is impossible to subtract an organic compound from your soil mix if you put something in it that you shouldn’t have. In mildly humid climates, I suggest starting with a 1/1/1 mix of perlite, vermiculite, and peat, add a little charcoal if you want to. Charcoal actually benefits in binding some salts, neutralizing chlorine, and absorbing other substances from your soil mix. It also acts as a natural deodorizer for your mix. If your climate is dryer, I would first increase the peat for a mix of 1/1/2.